Several soldiers, police officers and officers from other paramilitary agencies, on Monday, stormed the Makoko (Ilaje) water front area of Lagos, demolishing houses and shanties. More than 2,500 persons, mostly fishermen and their families, have been rendered homeless. There is pandemonium as the people were sighted running helter-skelter to avoid being shot by the armed soldiers and police officers. Meanwhile, The Lagos state government on July 12 warned Makoko residents that "their unwholesome structures on the waterfront" amounted to an "environmental nuisance", in a letter seen by AFP. 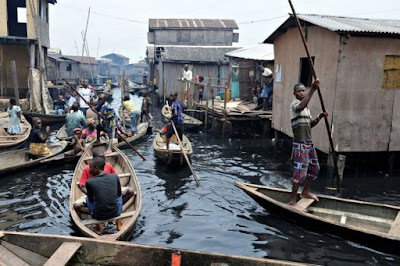 "Notice is hereby given to you to vacate and remove all illegal developments along the Makoko/Iwaya Waterfront within 72 hours," said the letter from the Lagos state ministry of waterfront, infrastructure and development. Sources: Radio Netherlands Worldwide and ThisDay, Nigeria.